The World Cup is now in full swing and, whether you love or loath it, football will dominate the news cycle over the coming month. It’ll feature on your social media feed. There will likely be heated water cooler discussions about it. Being aware of these sorts of big events is important for think tanks because disseminating research outputs isn’t just about producing punchy recommendations, or beautiful infographics. It involves something quite boring: consistent and careful planning. This vital, but often neglected, behind-the-scenes function is also what makes communications efforts across your organisation hang together. Planning grids are a brilliant way to plot and sequence key outputs in a strategic way. Newsrooms and government offices swear by them. And since thinktankers are in the business of trying to influence these actors, it seems sensible to make use them too. There is nothing particularly sophisticated about these grids. Each column represents a week in a given month, with a fifth ‘TBC’ column providing space for outputs that are confirmed, but not scheduled. The rows on the left represent key thematic areas that your think tank is working on. An extra row at the top captures important external events like public holidays, elections, summits and, in the case below, football tournaments. As Richard Darlington, one of the trainer on the On Think Tanks cutting-edge communications course and head of strategic communications at Well Told Story explains: “planning grids give you a physical representation of time and space”. In other words, they allow you to see where your outputs (blogs, events, etc.) are going to land, by time (week in a month) and by theme (research area). If updated consistently, planning grids provide an instant way to gauge whether the sequencing of your outputs is sensible, or even feasible. They are a helpful adaptive management tool that allow you to see a problem coming – say, scheduling a public event at the same time as the World Cup final – and make necessary adjustments. In our dummy grid above you can instantly spot that nothing is going on in week 2. This is because the column is literally blank. Similarly, you can see that the education team looks set to be very quiet all month. Grids allow you to fix these situations, evening out the peaks and troughs that can naturally arise and help avoid the dreaded submarine strategy. 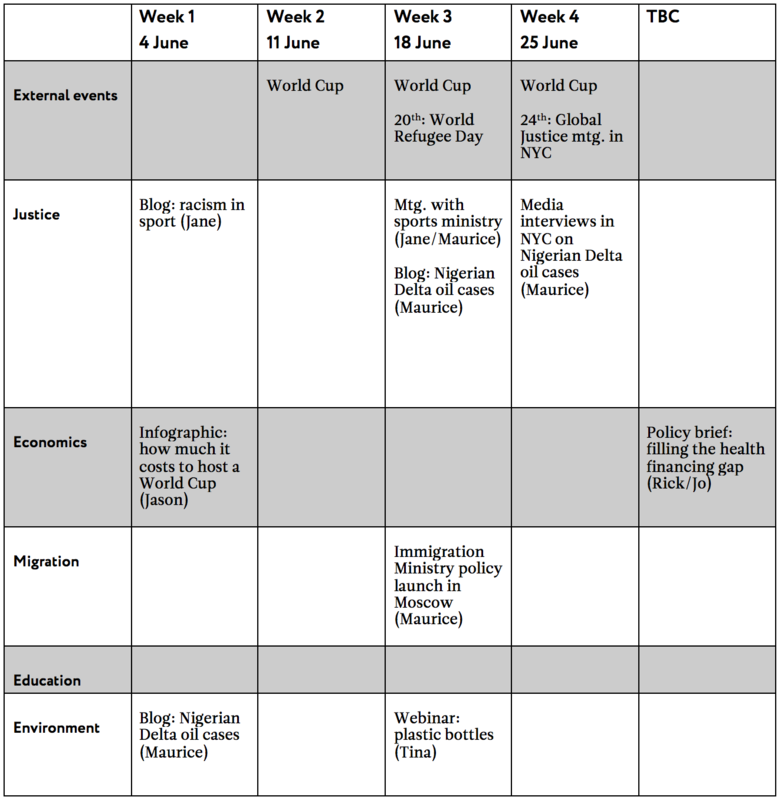 How important is it to publish two blogs in week 1, for example? If you assign ‘owners’ to each of the items on your grid, you can also spot situations where a particular department or member of staff has too much on their plate. This is very much the case for Maurice who is responsible for five outputs in June. Can something be pushed into July so that he doesn’t burn out? If not, could other colleagues be reassigned to support him? Planning grids can also help you cluster outputs in a more complementary way, and make better use of external events. In the case above, we’re clearly using the World Cup as a hook for the racism in sport blog. That’s great. But are we doing too much in June? Given that key audiences may be otherwise occupied, does it make sense to invest in a big policy launch in Moscow or a meeting with German officials? Regardless of the answer to these questions, grids provide the basis for these important conversations. With this in mind, they should be a regular feature of senior management team meetings. A discussion about your grid should happen weekly, no matter what. Even if a large chunk of your staff are away, watching football, for example.